Wow! Eleven years! Congratulations! 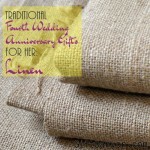 It is time to find a present for your wife! 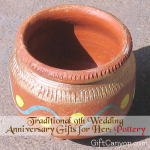 Classical wedding anniversary presents are usually themed — couples give each other things that are made or symbolic of a particular material. 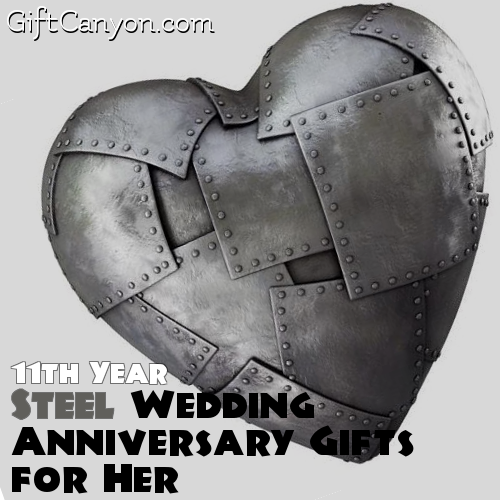 For the 11th wedding anniversary, the traditional theme is steel. 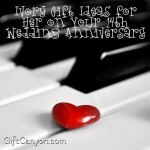 Why not get a few steel wedding anniversary gifts for her? 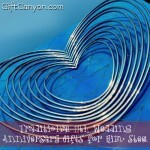 There are lots of steel stuff that you can gift your wife. Some are useful, some are romantic and some will fill her with laughter and fun! Here is a list, in those categories. 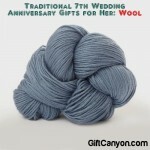 Please take note that this list is focused on gifts for women. 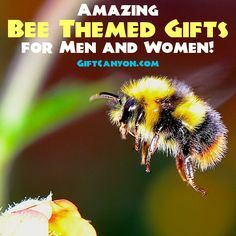 If you are a wife who is looking for gifts for her hubby, you should check my other list of steel presents for him. Steel jewelry like this super cute stainless steel drop earrings will look nice when she wears them during your wedding anniversary night. How about a stainless steel necklace? I love the look of this steel heart necklace. Hmm. “Steel heart” sounds tough! Anyway, the simple design looks so good and you can have it customized, too! 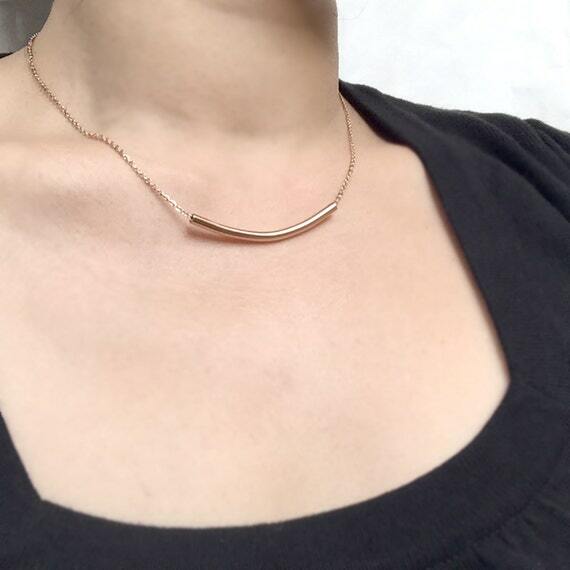 Or, you can also give her this steel curved bar necklace! It looks so nice! A steel broach will look nice on her formal dress. How about this super cute flower brooch made of steel? Stainless steel watch. This is a piece of jewelry that she can wear everyday! If watches are not your choice, you can also give her this stainless steel chain bracelet! 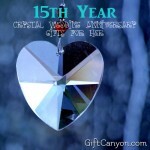 For all the jewelry gifts that you have given her for the past eleven years, you should also give her a steel jewelry tree! A jewelry tree will help her organize and display her shiny trinkets so she can admire them when she is not wearing them! 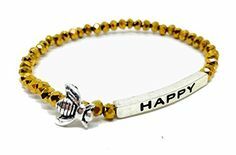 Perfect for women who have a lot of rings, necklaces and earrings. 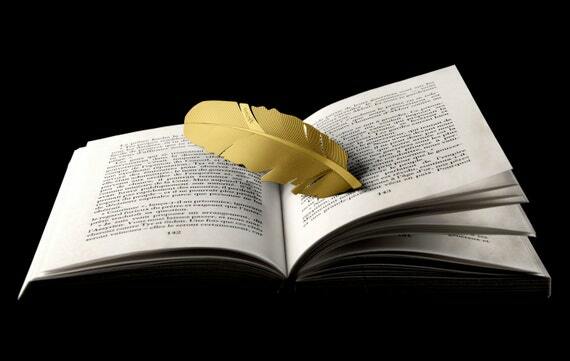 How about this stainless steel feather bookmark? It looks very elegant. 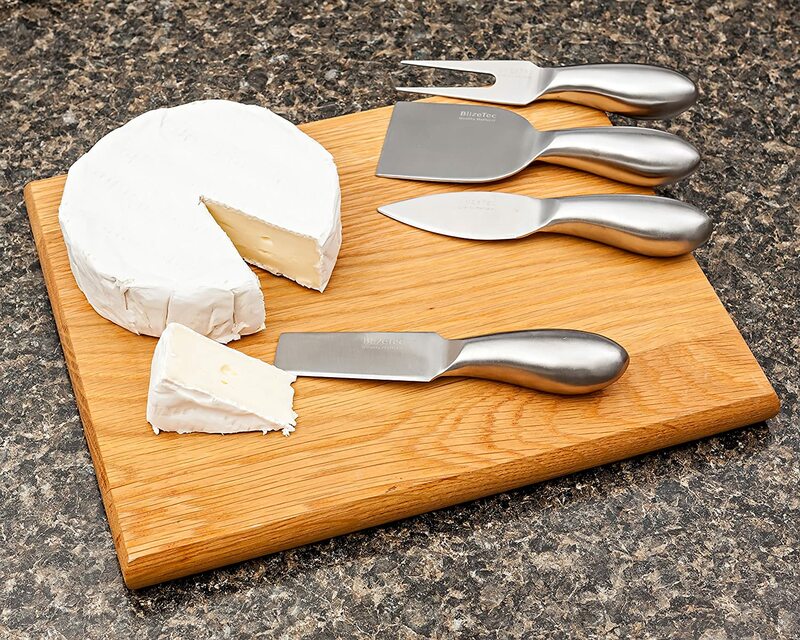 These cute stainless steel cheese knives will be a treasured collection that she will use only on special occasions! How about this stainless steel tea infuser? She will use this every time she wants to watch the sunset on your porch. Or, if she is not a tea drinker but a coffee fan, you can get her a chrome finish coffee maker. Get her this super cool french press coffee maker. Speaking of coffee, you can also get her this set cappuccino mugs with steel handles. Another coffee gift! A coffee grinder if she likes her coffee super fresh. 11 steel roses for the 11th year of marriage! 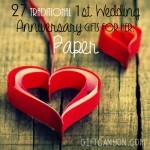 However, many women love getting romanced by their men on their wedding anniversary. 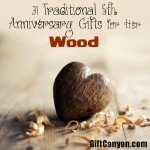 I recommend you get at least one steel gift from this list to make her blush! 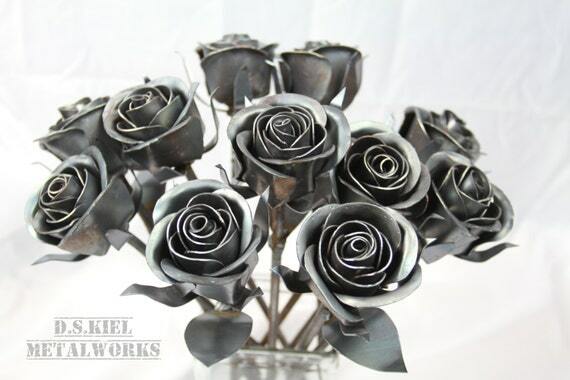 You should give her these super nice steel roses! Buy her eleven of these! This steel horseshoe heart is super cute! I bet she will hang this on her cubicle wall! 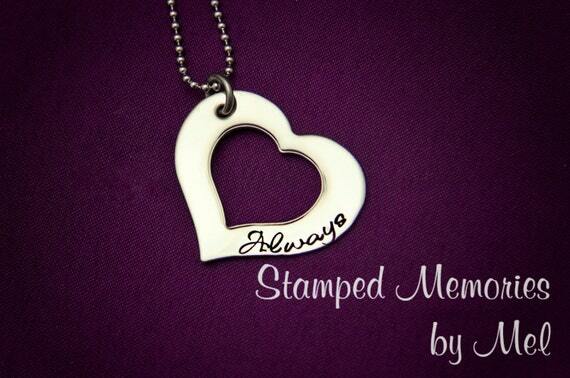 You can even customize it further by adding your initials and the date of your marriage! 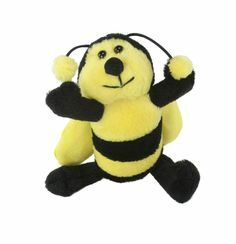 This is a really cute gift that she can display anywhere. You can also find this stainless steel picture frame. Find your most memorable pictures of you two and add them to the frame! 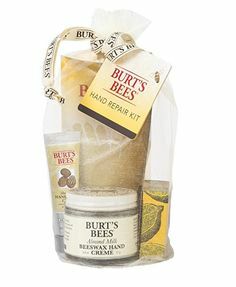 Add a super sweet message to make your gift even more personal and sweet. A stamped steel spoon bookmark is a really nice gift if your woman is a bookworm! This super cute steel floating heart locket will be her favorite piece of accessory if you put your most memorable picture in there, plus a few other things! How about these matching stainless steel bracelets? They look very nice and are good to use even if you are not together. 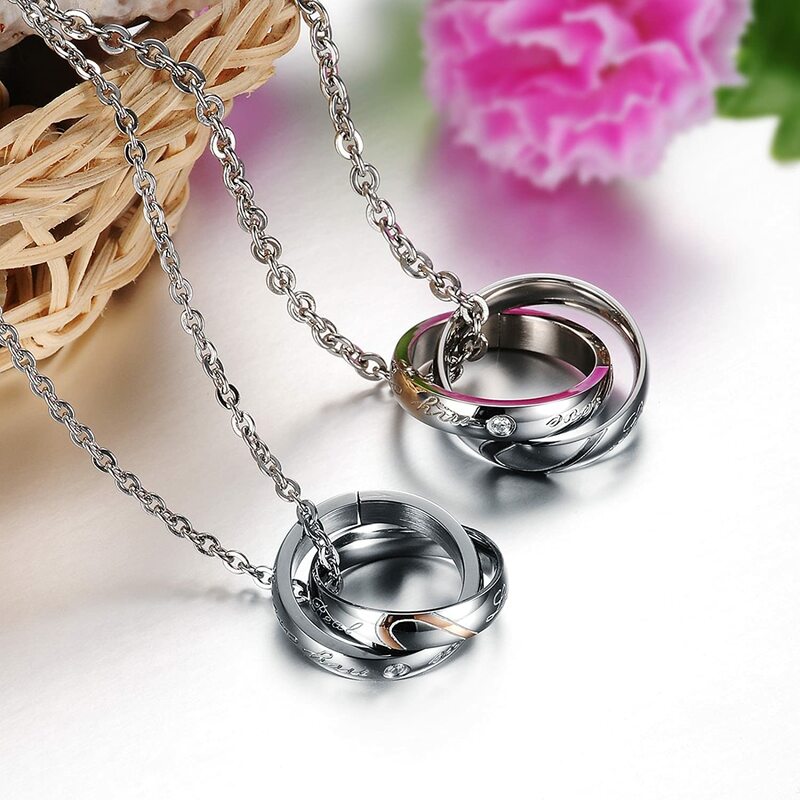 Or these matching stainless steel couple’s necklaces? If you are the kind of couple that preserve their wedding rings and wear them only on special occasions, you can get her this pair of couple’s rings.These are stainless steel and I know you bot won’t mind wearing these every day in lieu of your wedding rings. Stainless steel cocktail shakers make nice presents for steel anniversary. Make her the first cocktail! 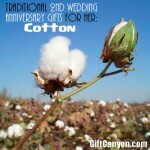 If you would like to go and have some fun with your wife on your wedding anniversary, you can get her one of these fun presents! Go to the amusement park and take the steel rides: roller coaster, Ferris wheel, octopus, etc. How about getting this Man of Steel movie and watch it together? 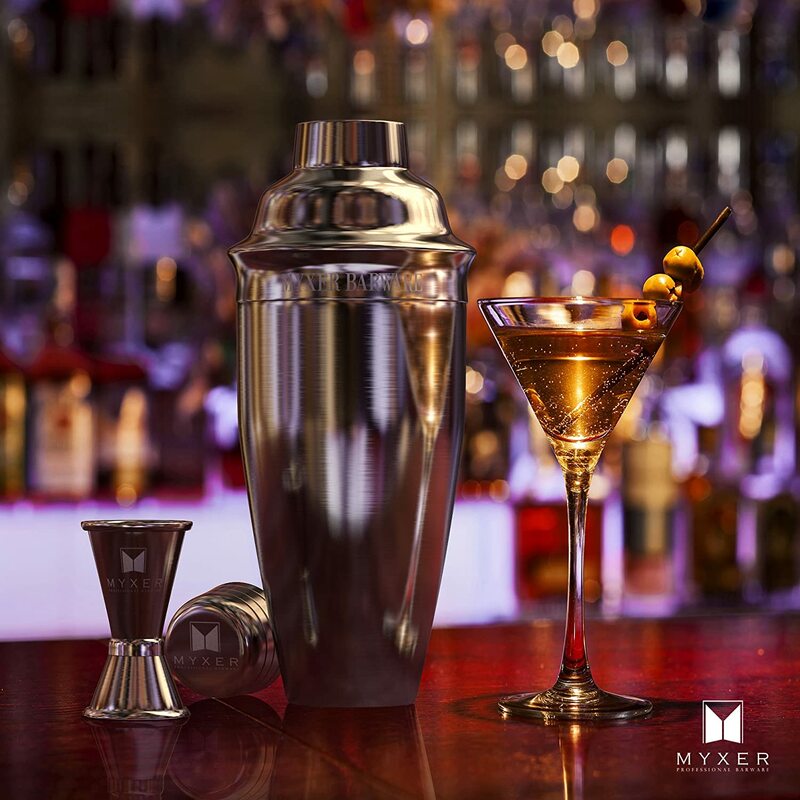 Steel cocktail shakers. Make her the first cocktail! Booze is always fun! You can get her this stainless steel icicle wine chiller. For cooler champagnes! 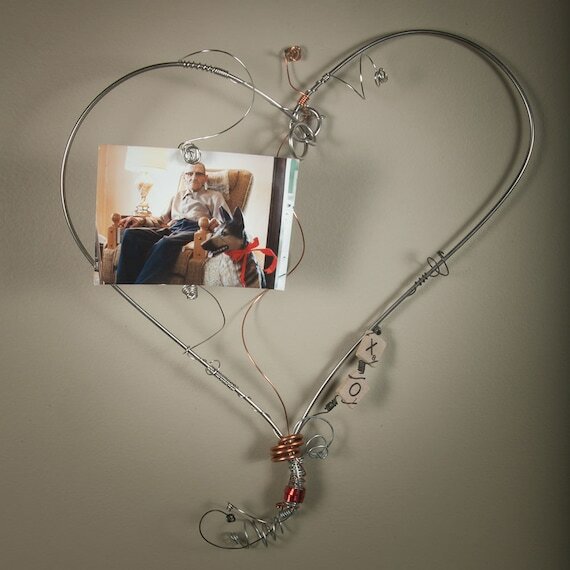 Where can I get the riveted steel heart sculpture featured on your page from? You can check out Etsy for that. 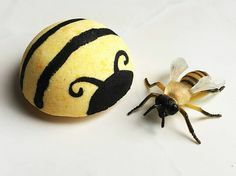 They have all kinds of handmade. Try this link.